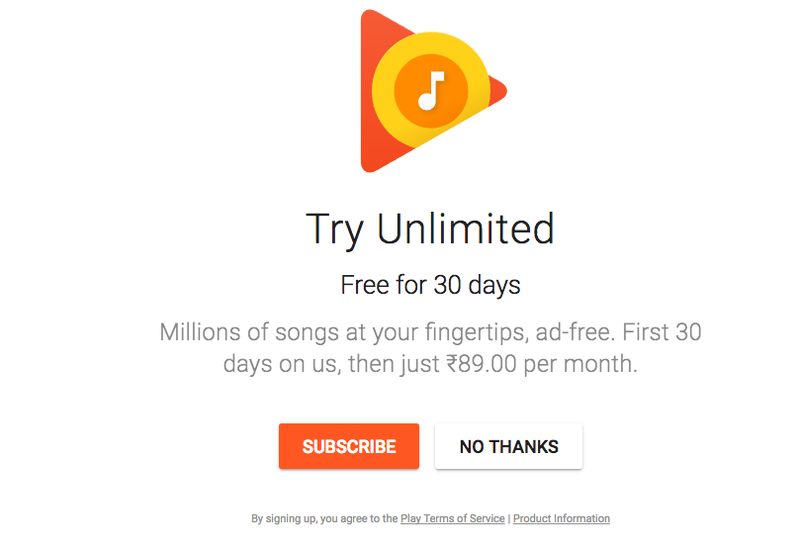 Google launched Google Play Music store in India in September last year and today, they finally launched its Play Music All Access music streaming service in the country. At only Rs 89 per month, the streaming service is among the cheapest in the country. As a bonus, Google is also throwing in a free 30-day trial for new subscribers. Some users are reporting that they are only being offered a free 14-day trail though. What makes the whole deal even better is that Google is making its full library of songs available for Indian users, with no restrictions or limitations being placed on the content that is available for streaming. Once you subscribe to Play Music All Access, you can select the genres of music and artists that you like so that the streaming service will be able to recommend you songs based on your taste. As you listen to more music and like them, the AI-powered recommendation engine will be refined further. Play Music All Access will also be able to recommend you songs and playlists depending on your location (work/home/gym etc) provided you have Google location history enabled on your Android device.